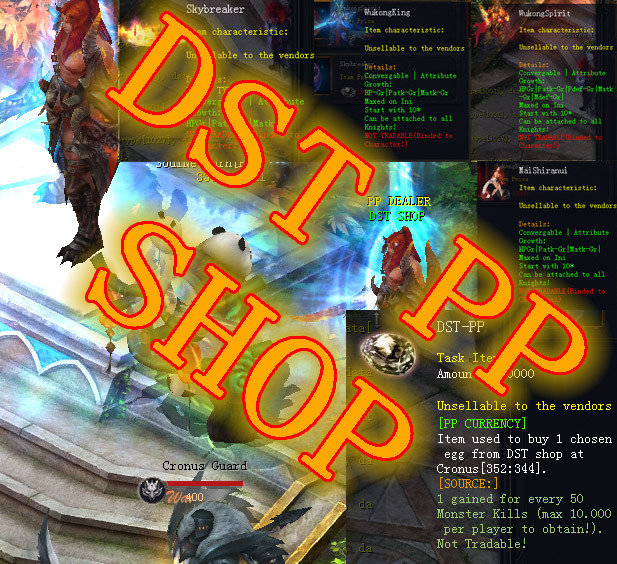 DETAILS: DST PP Shop was made only for one purpose – to provide additional option of buying special demons/mounts by players who simply wont be able to ever grab DivineStones(well thats impossible as even players will be selling DS but…). Case is to make players able get something special for proper trying! Whenever you will be hunting – exactly every 50 monster Kills you will receive +1 DST-PP directly to BAG! When you gather 10.000 of these items you can go to shop and chose your Egg to buy for this! * Max AMOUNT of DST-PP to obtain = 10.000. 1 Player cannot find ever more and cannot ever have more from any other sources! Thats max to achieve. * You will be able to buy ONLY 1 egg for 10.000 DST from 4 choices EVER! So be sure on what you deciding! * DST is NOT TRADABLE, NOT BOOTHABLE, NOT SELLABLE etc etc … This is FULLY personal item – same is about eggs obtained by this item! So remember that you will never be able to sell or move these items/eggs/pets/mounts! 0 Comments ON " DST PP SHOP "